The Desert Rose house in situ at the Solar Decathlon Middle East competition site in Dubai. 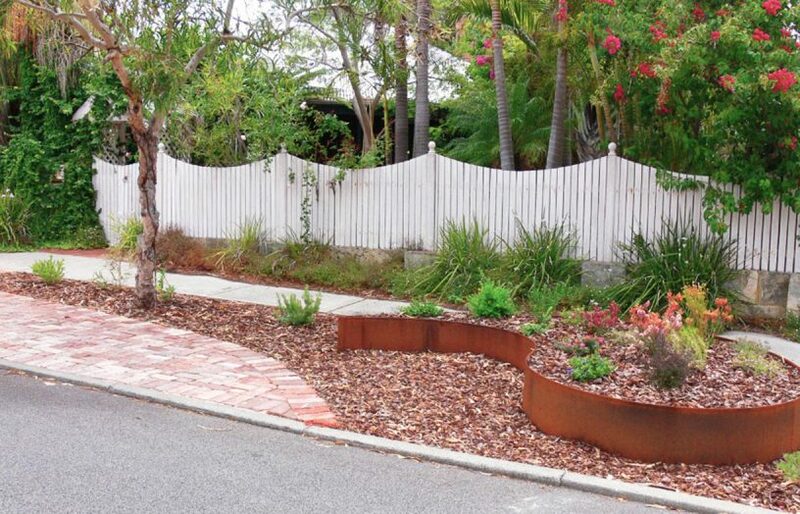 This article was first published in Renew 146. 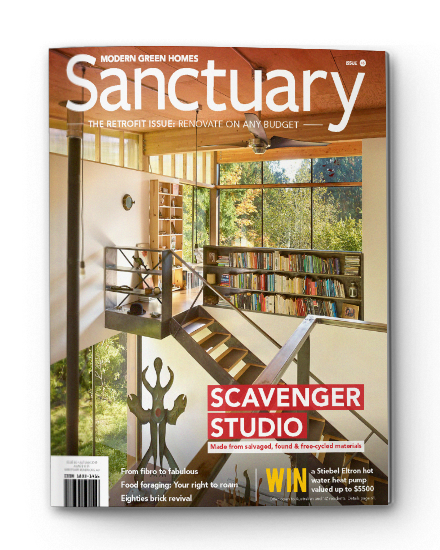 Issue 146 has both DIY projects and sustainable cooling as its focus. 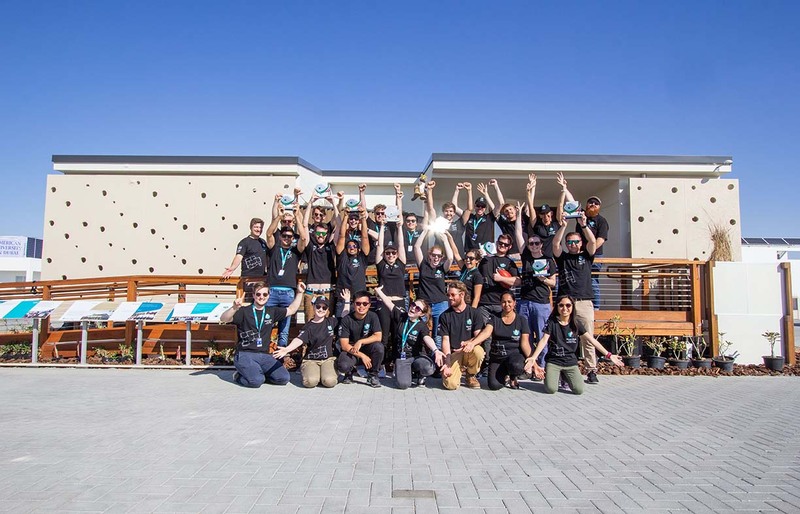 The international Solar Decathlon, a contest for university student teams established by the US Department of Energy in 2000 to encourage innovation in sustainable, renewably powered residential buildings, presents formidable challenges to competing teams. They must not only design but also build and operate a cost-effective net-zero home: one that produces as much energy as it consumes. And this year, they had to do it in the tough conditions of host city Dubai, where temperatures top 35 °C every day, humidity is regularly as high as 90% and rainfall is extremely limited. 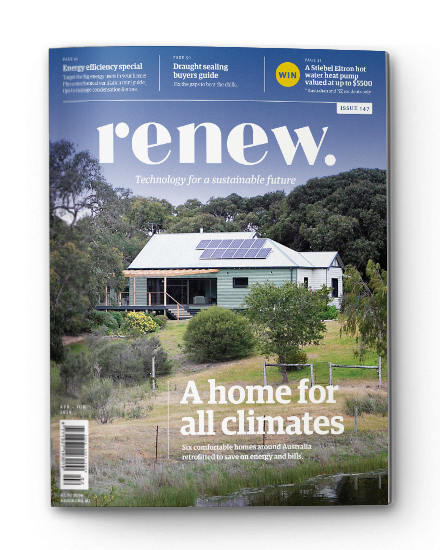 We reported on the University of Wollongong (UoW) team’s entry in Renew 141 a year ago, when their concept design, aptly named the Desert Rose house, had just been selected as one of the finalists for the Dubai competition. The team designed a compact two-bedroom house within the competition’s strict 90 m2 size limit, with a ‘social good’ focus in addition to the net-zero energy goal: they designed a home that caters for the changing needs of occupants as they age, specifically considering design for dementia. For the past year, the team—over 200 students have been involved—has been hard at work refining their design, researching technical solutions, and building and testing the house. 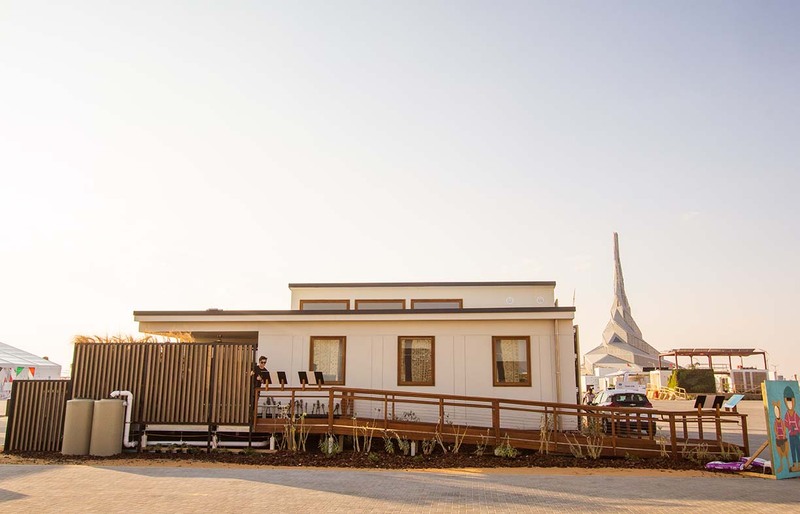 In October 2018, a 42-strong group headed to the Middle East to construct the house at the Solar Decathlon site and get it ready to compete in the 10 different contests that make up the overall competition. So what design features and systems did they settle on, and how did the house perform? Desert Rose’s hot water tank, HVAC air-to-water heat pump, and the two PCM tanks on site in Dubai. Pictured behind the hot water tank, the shading ‘second skin’ wall proved very effective in this climate, with the external house wall behind it measuring 16 °C cooler than the second skin wall itself. 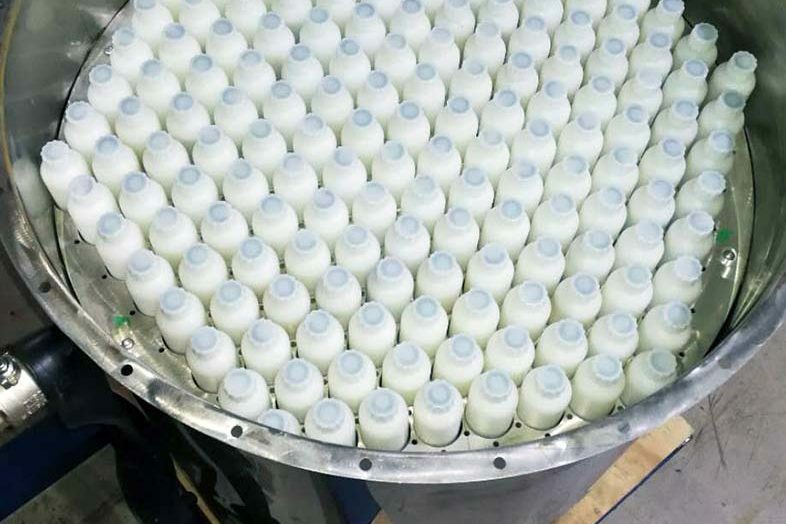 The phase change material (PCM) ‘thermal battery’ consists of two tanks filled with water and bottles of salt hydrate PCM. The team used an air-to-water heat pump as the primary source of cooling, coupled with two fan coil units. Technically a type of hydronic cooling, the system involves the heat pump chilling water to around 13 °C which then passes through a coil in the fan coil unit. The fan blows air past the coil to cool it, and it’s then supplied to the living spaces. As the humidity in Dubai is surprisingly high, the team carefully considered options for dehumidifying the incoming air to reduce the load on the fan coils, thus requiring less energy. They had planned to design and build their own ‘desiccant wheel’ to act as a continuous humidity exchange system, but the short timeframe made this too much of a stretch and instead the team opted to use a Daikin Desica dehumidifier unit, an Australian first. The Desica contains two batches of silica gel desiccant, one absorbing moisture from incoming air as the other is ‘regenerated’ by being dried by outgoing air. Of course, the design of the house includes many strategies to reduce heat gain in the first place, to mitigate the need for active cooling. Roof, walls and floor are all insulated close to an impressive R6. A perforated ‘second skin’ concrete panel wall sits 100 mm off the external cladding on the east, south and west walls, providing shading to the house on the sides of greatest solar gain in Dubai (in the northern hemisphere). 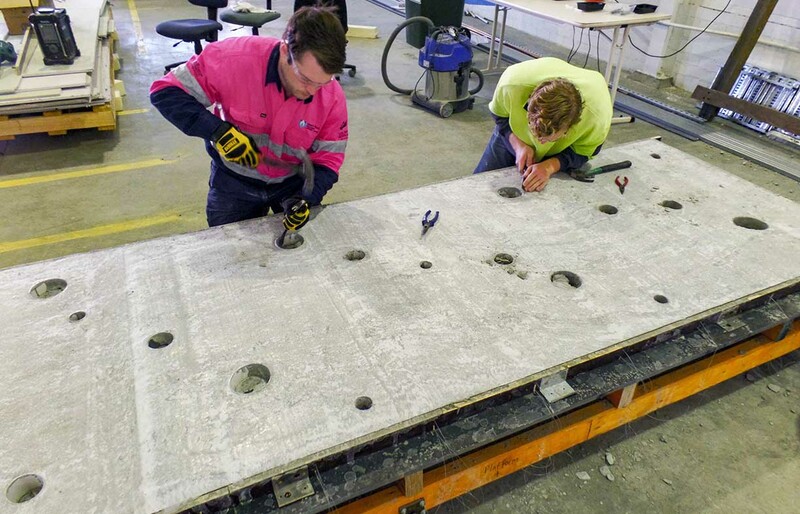 Made of a lightweight foamed concrete using recycled glass powder as a cement replacement—a mixture developed at UoW—and reinforced with a carbon fibre grid, the second skin was effective in testing at home in Wollongong, with the cladding behind it recorded at up to 12°C cooler than the second skin itself. In Dubai it proved even more beneficial, with a temperature difference of 16°C, and the team expects this differential to increase even further in the hotter months. The house is designed around a courtyard to the south (in Dubai) with a green wall that provides privacy from the street. “There is lots of glazing on the north of the house—away from the direct sun at this latitude—for natural light with minimal heat gain,” says Brendan. All windows are triple-glazed, and those on the southern and eastern facades have a very thin layer of Viridian Microshade mesh fixed to the interior surface of the external pane of glass; tiny angled holes in the mesh admit light while excluding some thermal radiation. The house is shaded on three sides by a concrete ‘second skin’ wall, developed by the UoW team, that sits 100 mm off the external cladding. Peak energy load is a big issue in Dubai due to their very high demand for cooling during the day, and Brendan notes that any innovation that shifts Decathlon houses’ energy load away from peak times is highly regarded by competition organisers. One of the sub-contests is a race for the lowest energy bill, so in addition to energy-efficient design and solar generation, minimising the need to draw from the grid at peak times (when electricity is more expensive) is key. To help with this, the Desert Rose team developed what they consider to be the most innovative component of the house’s HVAC system: a pair of phase change material (PCM) tanks that Brendan describes as “a 35 kWh liquid thermal battery”. 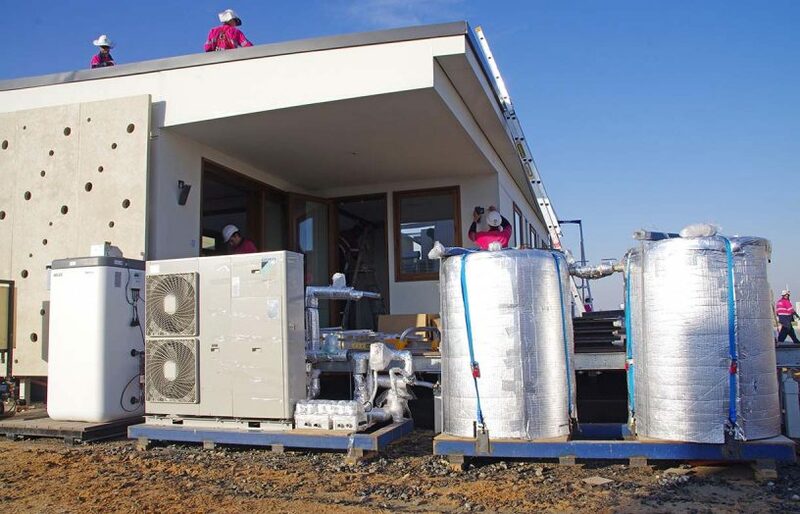 Filled with water and a salt hydrate PCM, the tanks can be cooled using the air-to-water heat pump at night when the ambient temperature is lower, increasing the coefficient of performance of the heat pump. “The thermal store is then used during the middle of the day to drive the fan coil units instead of using the heat pump. This reduces the electrical energy required to operate the HVAC system between 12pm and 5pm by up to 75%,” explains Brendan. 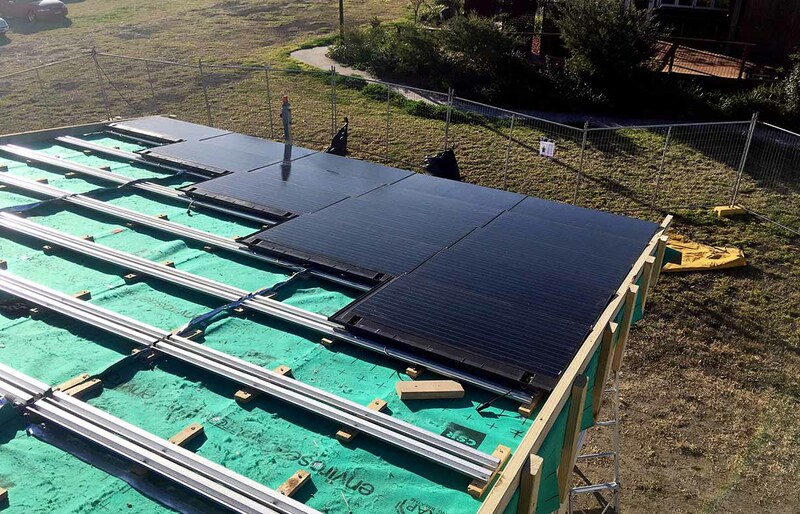 Naturally, renewable energy generation is a key part of any Solar Decathlon project. The team’s primary energy strategy was to be as grid independent as possible, aiming for zero energy bills. 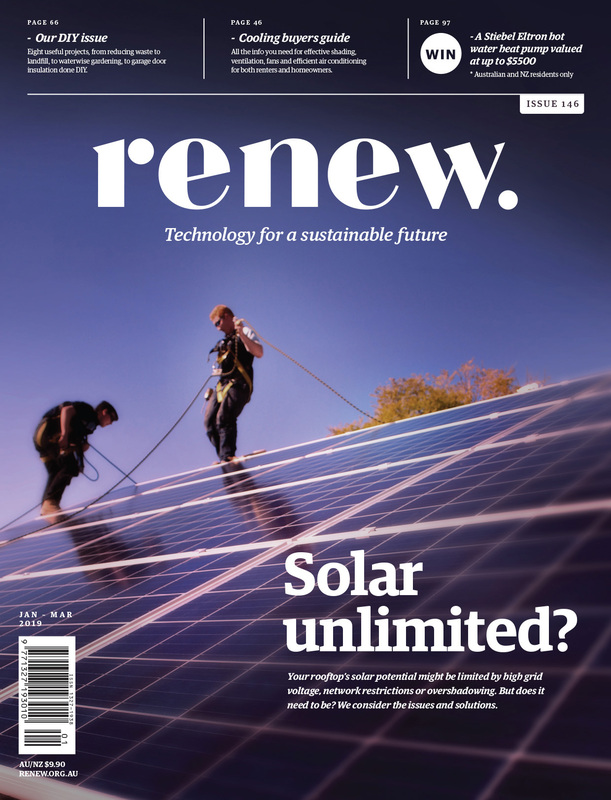 “For sizing, we wanted the solar PV system to cover the full load for the house, even under the most challenging conditions we might expect in Dubai,” says Brendan. They calculated they’d need just over 38 kWh per day, including 8 kWh for the electric vehicle (running an EV is a new requirement for the 2018 contest). 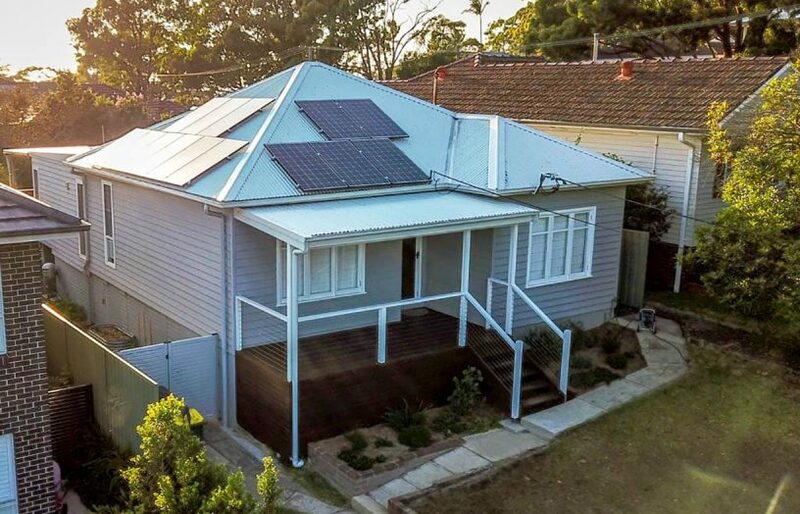 “Using weather data for the competition site and taking into account that PV efficiency degrades as the temperature rises, we decided 10.4 kW of panels was enough to cover the house’s energy use year round.” This size of system is estimated to produce 52 kWh per day on average in Dubai, plenty to ensure the house is net zero for energy. The PV system consists of 104 building-integrated photovoltaic thermal tiles (BIPV-T) from Tractile Solar, each 100 W. It’s a system with multiple benefits: as well as functioning as the roof structure (reducing materials) and generating electricity, the tiles contain water pipes for hot water; the circulating water also cools the panels, which increases the solar cells’ efficiency by up to 10% and maintains the roof at 40–50 °C rather than 70–80 °C, keeping the building envelope cooler. “There’s a specific award for the best building-integrated solar; we are happy to have come in second,” says Brendan. The expected load calculation uses a machine-learning algorithm that makes use of past data on occupants’ energy consumption, weather, day of the week and so on. However, Brendan says that for the purposes of the competition the load was much easier to predict, as they knew exactly what time they would be running an appliance, turning the lights on, operating the HVAC, charging the EV and so on. Tractile building-integrated photovoltaic thermal (BIPV-T) tiles—104 of them—are installed on the roof of the Desert Rose house, providing electricity generation, hot water and cooling the building envelope. Integration and smart control of the house’s various systems is very important for getting the overall energy management right. “Automation has been a really big learning curve for the team,” says Brendan. They chose open-source platform KNX as the home’s automation protocol as it’s compatible with IoT (Internet of Things) devices from multiple manufacturers as well as IoT technologies developed at UoW, such as LED lighting controllers. Among the most innovative of these devices are smart electronic taps: an LED that changes colour depending on the water temperature gives visual feedback to the user, and each tap can have a maximum temperature set via its own Raspberry Pi controller, a boon for avoiding scalds to elderly, frail skin. The taps can be programmed to turn off if they are accidentally left on, and as they are free spinning with no mechanical resistance, they are good for arthritis sufferers. All KNX and IoT data is collected online in the Node Red platform, which allows the team to customise and program many aspects of the house’s operations, such as when to charge the electric vehicle or charge the PCM tanks based on the solar forecast for the coming 24 hours. “Using Node Red is the key to the integration of all the systems,” says Brendan. “It’s given us a lot of flexibility and let us link things together that weren’t linked before.” The team can also create multiple graphical interfaces to cater to the technologically savvy as well as much simpler controls for people living with age-related illnesses. Inspired by the growing number of people living with dementia and the limitations of many existing homes for ‘ageing in place’, the team set out to design a flexible home that would improve the quality of life for elderly residents who may be experiencing early dementia. 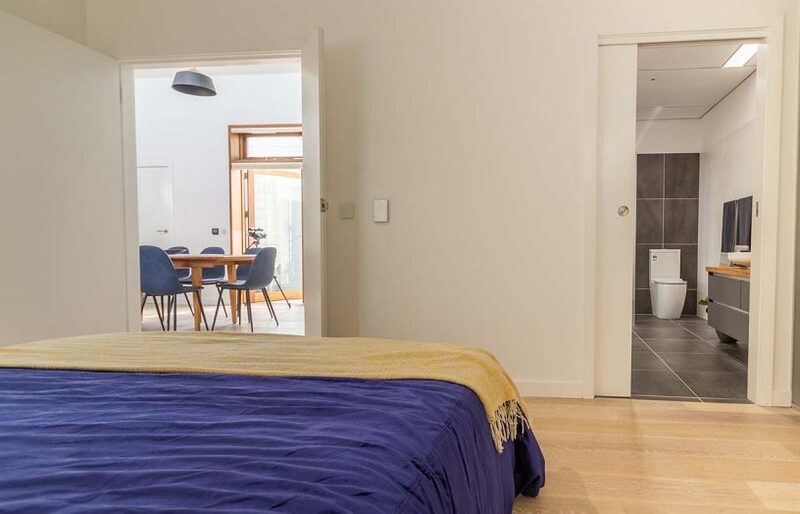 The whole house is wheelchair accessible, down to the placement of the furniture that allows wheelchairs freedom of movement; the main bedroom and entry doors can accommodate a hospital-style bed if needed. Brendan says that one big focus when designing for dementia is ‘line of sight’ to facilitate easy navigation and provide visual cues for living. The main spaces in the house are all visually accessible from various key places. “When lying on the main bed, there are two doors through which you can see straight through to the kitchen table—associated with eating—and to the bathroom. Research shows that those with dementia are up to eight times more likely to remember to go to the toilet in the night if they can see it,” he explains. 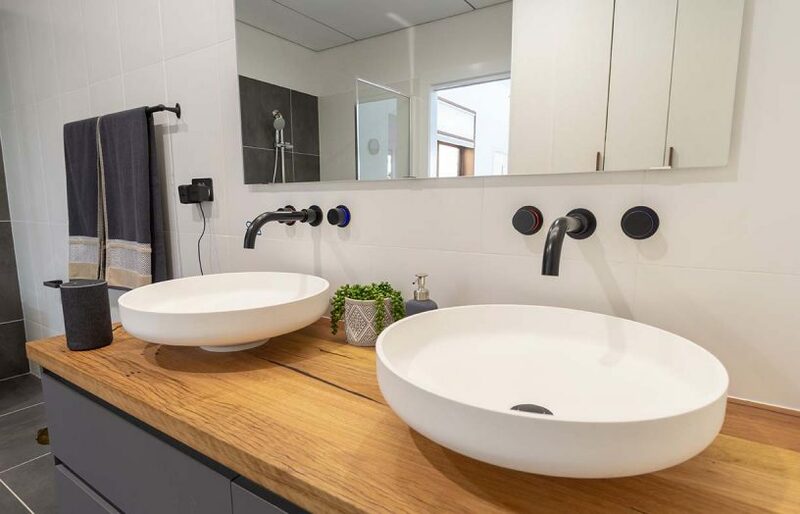 Another useful strategy is high contrast, for example a white toilet suite against dark tiles; in addition, shiny surfaces have been avoided as they can appear slippery and thus dangerous to residents with dementia. Inside, the layout provides lines of sight that can help people with dementia; for example, both the dining area and the toilet can be seen from the main bed, providing visual cues for living. The house’s taps are free-spinning with no mechanical resistance, making them easy to use for arthritis sufferers. Raspberry Pi controllers allow the maximum water temperature to be set separately for each tap, reducing the chance of scalds, and they can be programmed to turn off automatically if they’re accidentally left on. 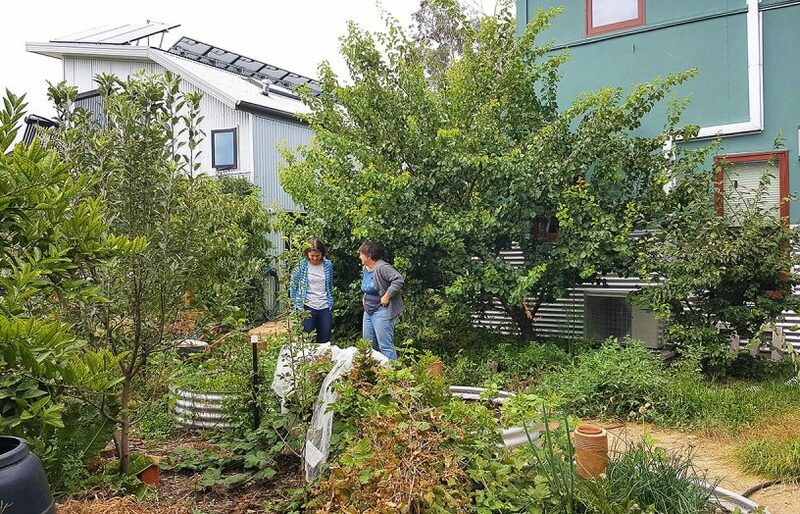 The Desert Rose house will be returning to Australia to be erected on the University of Wollongong campus next to the Illawarra Flame house, which won the Solar Decathlon in 2013 and these days is open for short-term stays to allow people to experience living in a high-performing, net-zero energy building. Solar decathlon results - second place overall! The Desert Rose team took away a swag of awards from Dubai, including overall second place—a terrific result. Along the way, they achieved wins in the Innovation and Comfort Conditions competitions. They came second in the all-important Energy Efficiency contest, and third in Sustainability and House Functioning. The team also picked up additional awards for sub-contests: first place for Interior Design, and second place for Building-Integrated Photovoltaics and Creative Solutions. The team’s project manager, Clayton McDowell, is justifiably proud of their performance. “Coming second in Energy Efficiency was an amazing result, and we were only 0.8 points off first place. We worked really hard to ensure that we included as many passive features into the design as possible to reduce our thermal loads, and then coupled this with a very innovative and efficient active HVAC system. “This also flows into our first place in Comfort Conditions. Our Building Services team worked extremely hard and had to steer the house like race car drivers, carefully monitoring the internal and external conditions deciding when is the best time to naturally ventilate or do we turn the HVAC system on. For example, do we sacrifice points from the CO2 [fresh air] category in order to maintain humidity and temperature? These decisions were made constantly and through having a very dedicated team, an excellent passive design and an efficient active system we were able to steer our house to first place. The UoW team celebrates their achievements outside the Desert Rose house in Dubai.